Fossil fuels are running out and killing the planet. Scientists in Oxfordshire are trying to tame the power of a sun for alternative energy. Interior of JET. Picture taken from the CCFE reception area. On a cold and wet November morning, I was lucky enough to visit the Culham Centre for Fusion Energy (CCFE) in Oxfordshire. The reason for my visit was to take a tour of the Joint European Torus (JET) and the Mega Ampere Spherical Tokamak (MAST) fusion reactors. Exterior of MAST with grey insulation layer visible and ports for equipment access. To the left is the Neutral Beam Injector which uses a beam of particles to heat the plasma. 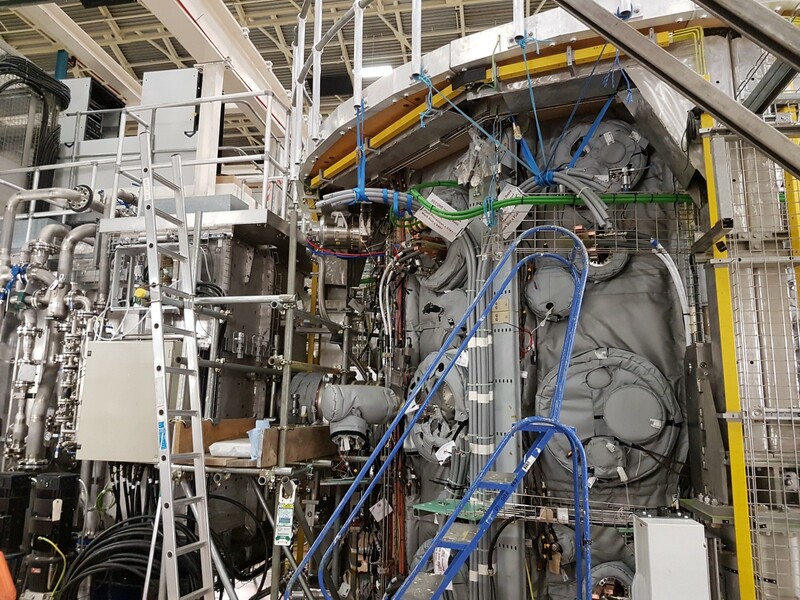 At first glance, the JET fusion reactor looks like a huge mass of steelwork, piping and wiring like you would usually expect to see at a refinery. It is within the centre of this concentration of equipment that scientists are creating and trying to harness fusion, which is the process that literally powers the stars like the Sun. This would, in turn, enable a huge revolution in how we meet our energy needs for the future, if successful. Cutaway model of MAST. The interior more spherical “cored apple” shape is visible in the interior reactor chamber. 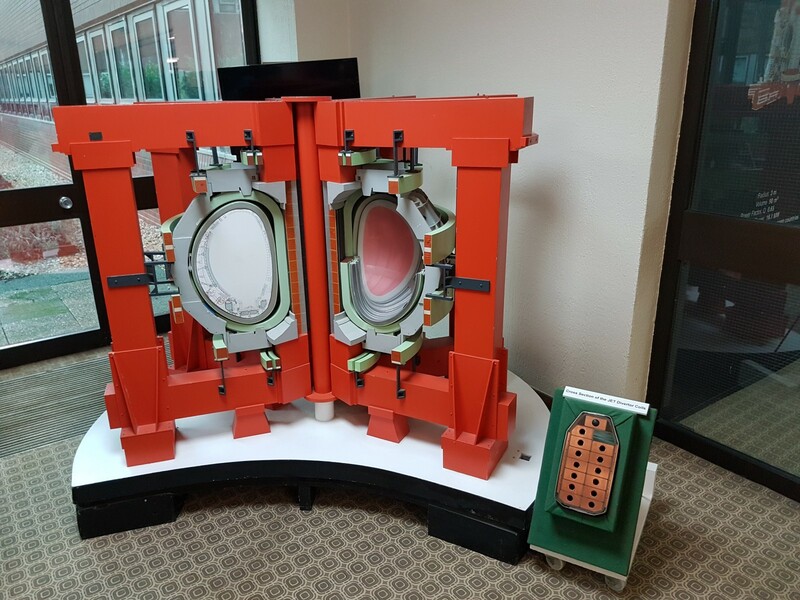 MAST and JET use variants of a tokamak design, which was first conceived in the 1950’s in the Soviet Union. It consists of a donut shaped chamber (the shape is almost spherical, like a cored apple inside MAST), which is under vacuum. Into this, atoms of hydrogen are injected and subjected to temperatures of over 200 million degrees — ten times hotter than the centre of the Sun! This causes the hydrogen to turn into a plasma, which is an electrically charged gas. 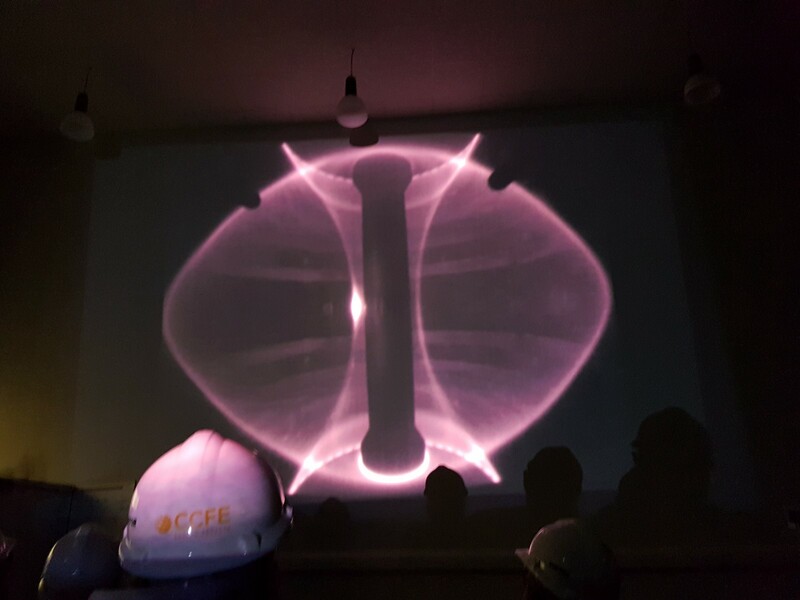 To confine the plasma within the central region of the donut, incredibly large and shaped magnetic fields are applied to it. This serves two purposes: first, to keep the plasma from touching the reactor vessel walls, and second, confine the plasma to a high enough density that atoms of hydrogen combine together and form helium, while also releasing more energy in the form of neutrons. This excess energy is captured in the walls of the reactor vessel by stray neutrons that hit it. This heat would then be taken away to generate steam and electricity, like in a normal power plant. High speed camera footage of fusion inside MAST. The almost spherical shape can be seen. The rings at the bottom and top are the “diverters”, these remove waste gases from the plasma. The central region is so hot it is only emitting in X-rays and not visible light and so appears see-through compared to the edges of the plasma emitting pink light. Fusion is in fact very different to the nuclear fission that occurs within our current nuclear power plants. Fission breaks large atoms apart to generate power and the main difficulty is to keep the reaction from running away. It generates very long-lived hazardous waste and the fuel is scarce and expensive. Fusion solves these problems, and the only difficulty is keeping it going; it generates no emissions (except Helium), the fuel comes from water and lithium, and the waste is in materials contaminated by neutron exposure. This is only a problem for a few hundred years, which is manageable with current technology. 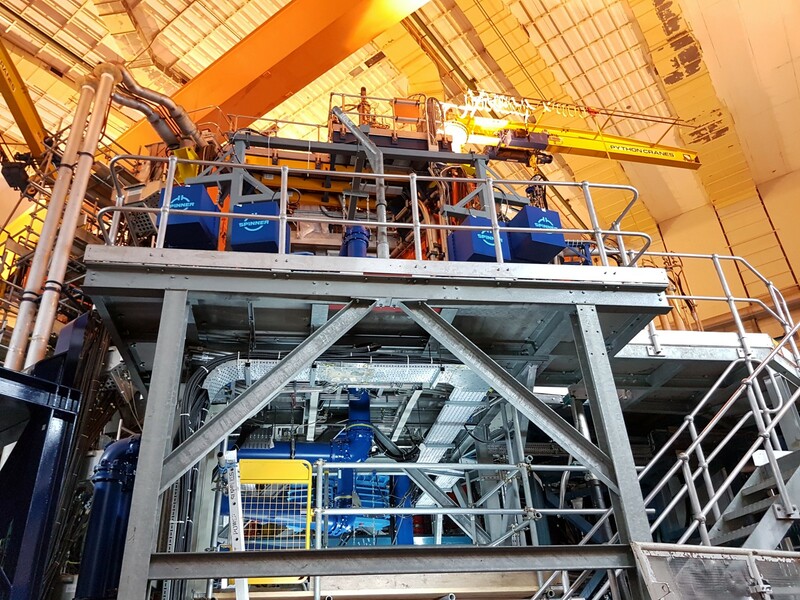 Currently both JET and MAST are testing technologies to go into the next generation reactor being built in France. Called ITER (Latin for “the way”), it will be twice the size of JET, utilise some of the most advanced technologies available, and should be capable of generating 500 Megawatts (the equivalent of around 400,000 homes) of heat energy for tens of minutes (JET’s largest output was 16 Megawatts for less than a second). 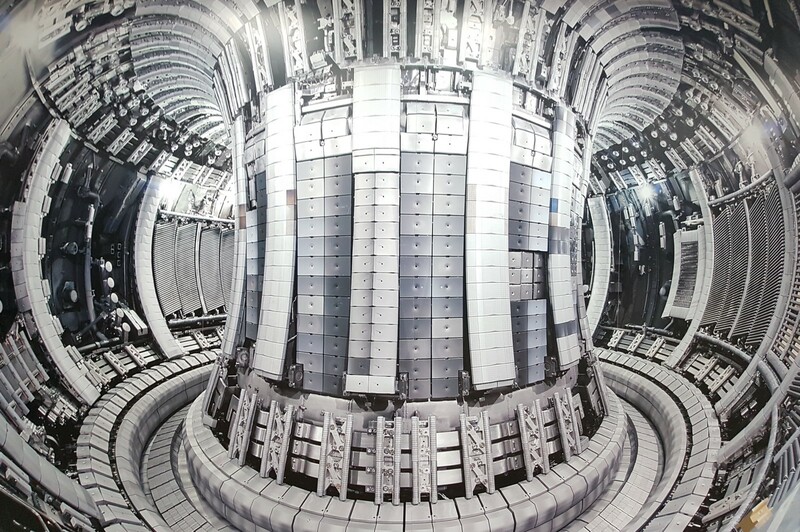 This is one of the most exciting times for fusion energy, as with some luck, by the middle of this century, fusion power plants could potentially be giving us a greener future. Data Scientists, Astrophysics PhD, reliability engineer and part time writer. I love exploring the world of science and how it shapes the world we live in.